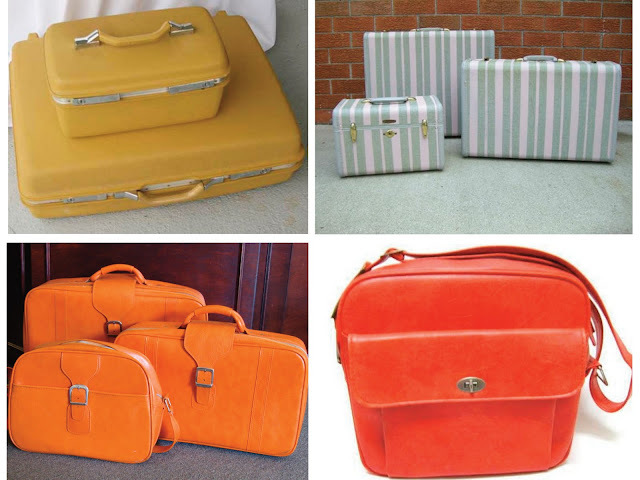 Last night's episode made me swoon over the vintage Samsonite luggage. As I mentioned in last Tuesday's post, I always see pieces like the ones featured in this episode at second-hand stores, and they're almost always completely functional. So why is everyone dumping them at their local donation center? Are they not functional for today's traveler? Yes, airplane travel today is not what it was in the 1950s and 1960s. Today we have to have an attitude of convenience when we consider how to pack for trips: How can I get through security the fastest? What's the biggest piece of luggage I can bring that will still fit in the overhead bin? Should I even bother to pack toiletries or just borrow some when I get there? The answer to these questions (based on what I've seen in my airport travel) seems to come most often in the shape of a small black rectangle on wheels with a pull-out handle. That's what my luggage is; and I have it in three different sizes. When I do check a bag, I have to have a very discerning eye to find mine on the carousel since it looks just like the luggage of all my co-travelers. The only thing that makes it stand out is the worn piece of blue painter's tape I put across the top handle when I first moved to California. You know what else I have in our storage unit? Three pieces of beautiful vintage luggage I picked up at various thrift stores. I knew I might not use them, but the price was so low I just couldn't pass them up. One is a Samsonite overnight bag in a beautiful light blue color that I've used a ton on weekend trips. The second is this amazing multicolored Skyway hard case (see below) that fits the overhead bin requirements, yet it hasn't seen any action. And the last is this teal and black tweed case (checked baggage size, see below) that's currently storing my fall sweaters. I've been on plenty of trips since I bought them...so why haven't I used them? I...don't...know. But it's gonna stop here and now. The next time I'm taking a plane is Thanksgiving, and I swear as a former Brownie (sorry, never made it to Girl Scouts) that I will use this luggage...and it will be a triumph of second-hand style.